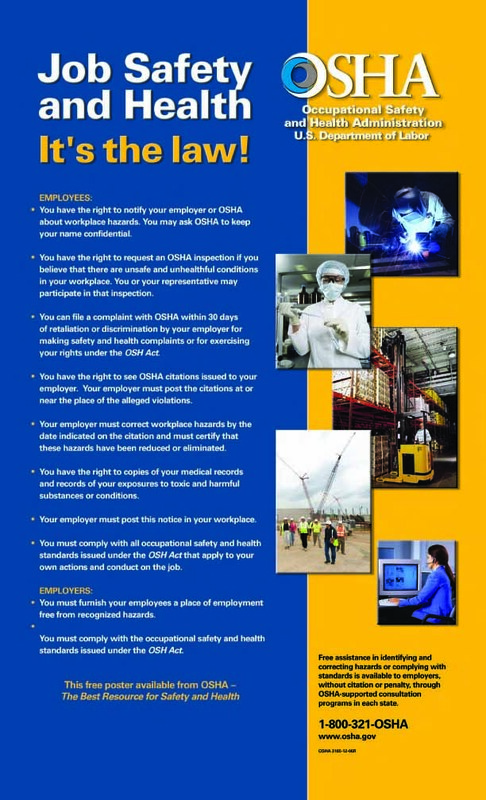 Did you know that OSHA requires all employers to have a poster titled Job Safety and Health: It’s the Law? This poster informs employees their rights under the Occupational Safety and Health Act. The only real requirements are that it must be posted by the employer in each establishment in a conspicuous place or places where notices to employees are customarily posted. Each employer shall take steps to insure that such notices are not altered, defaced, or covered by other material. You can download it, order it, or print it to be in compliance. Anther good fact; its available in Spanish, Polish, Korean, Chinese, Portuguese, and Nepali.